Social media works in beautiful ways. In Hong Kong, an image of a protester shielding himself from tear gas with an umbrella has become a symbol of the city's massive pro-democracy demonstrations. "Umbrella man" has been shared on Twitter thousands of times and due to such images, the umbrella has become an official mascot for the protests. 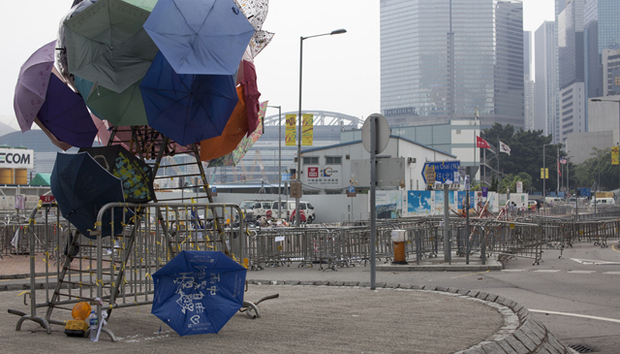 The photograph of the “Umbrella man” is being compared to the “Tank Man” at the Tiananmen Square protests of 1989 and rings the right bell both with historical dissident experience and current developments in the use of technology for politics. These protests in Hong Kong are over the question of universal suffrage. Beijing has promised that it will allow this only if candidates for Hong Kong's chief executive, the top government position, are chosen by a committee consisting of majority pro-Beijing interests, rather than selected by open nomination. Activist groups like Occupy Central, a pro-democracy civil disobedience movement, and Scholarism, a student-led group, are pushing back at policies that they see as an encroachment upon Hong Kong's autonomy. In the face of the movement’s popularity and propulsion through social media China’s need to control information has been seen yet again. But a lesson that governments like China’s must learn now is that information gets out. Nothing can really be hidden, especially not for a long time. Hong Kong is officially ruled by China, but it's semiautonomous and enjoys freedoms mainland Chinese do not. One of them is freedom of the press, which China agreed to respect for 50 years after sovereignty over Hong Kong was transferred from the United Kingdom to China in 1997. According to Adam Segal, an expert on China and a director of the Council on Foreign Relations' Program on Digital and Cyberspace Policy, China can't censor information in Hong Kong. However, Hong Kong's Bill of Rights states the government could crack down on certain freedoms in a public emergency. With the current demonstrations in Hong Kong against China backed electoral reform, China is doing everything it can to contain and censor dissenting voices. It has told the Chinese media not to report on the protests. It has blocked Instagram and censored Weibo, a Chinese social network. Facebook and Twitter are already banned in China. Though people inside China may have a hard time accessing information on the protests, the protests have great visibility internationally. And the potential reach of these protests has Beijing worried. Within china, the government has been cracking down on internet users who demonstrate sympathy for the Hong Kong protesters and almost a dozen people have been detained. The rate of Weibo censorship on September 28th, two days after the Hong Kong protests began, was more than double that seen on the twenty-fifth anniversary of the 1989 Tiananmen Square crackdown, earlier this year. At its peak, Weibo had 152 censored posts per 10,000, according to Weiboscope, an analytics project run by the University of Hong Kong. In mainstream media, several Chinese media outlets criticised the protests, calling them an “illegal assembly”. But they also tried to play down the demonstrations by minimizing the coverage. Reports on Hong Kong do not feature on major Chinese news websites such as Xinhua and People's Daily. In September, these sites were instead focusing on the 65th anniversary of the founding of the People's Republic of China. When The Global Times newspaper published a commentary that had suggested military force could be used to quell the protests, the story was later removed from the website. Internet users are getting more and more creative in trying to circumvent the Chinese firewall. Ingenious ideas include, getting around automatic filters by misspelling words or writing in code. Instead of writing “June 4,” the date of the Tiananmen crackdown, people would write “May 35.” Censors eventually caught on but there is a subaltern resistance to China’s iron fist. Chinese from the mainland have also shown their support for the Hong Kong protests by sharing images of umbrellas, which demonstrators used to ward off tear gas, online. The protestors in Hong Kong have been planning ahead in the case of the government shutting down internet and telecommunication. One of the apps that they have been downloading is FireChat, which doesn’t need a cell connection or the internet. This allows users to communicate using Bluetooth or cellphone radio. With such apps, social media might evolve into not even needing the internet to operate. This is a huge development for anti-government protest movements. The sense of being part of a global online community has encouraged the protest movement. Jessica Fan, a volunteer, posted photos of Hong Kong protesters on Facebook, and received encouragement from people in places ranging from France and Ireland to Myanmar. This is an important victory as China has been trying to soften its image internationally and has been making a play for international economic power. Such movements should cause China to look inwards. While it is open to liberal trade and peaceful ties outside, it needs to open up domestically as well. If it does not do so itself, it will be forced to by outside pressure. The freedom of information and press is a human rights issue, and the world is watching. The Chinese government's crackdown on internet communication is the latest skirmish in a series of such struggles. This will continue to be a trend this century: the faceoff between the government's ability to control information technology versus its dissidents’ capacity to use it. Social media won’t prevent Beijing from cracking down on the protesters in Hong Kong. That we can say for sure about China. It is easy to shut down newspapers, block websites and ban social media. However, if violent repression occurs, the world will be watching in real time.